Garzke, William H.; Robert O. Dulin, Jr. (1995). 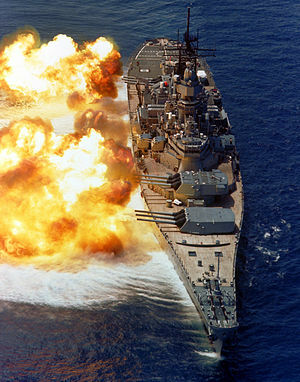 Battleships: United States Battleships 1935–1992 (Rev. and updated ed.). Annapolis: Naval Institute Press. ISBN 978-0-87021-099-0. OCLC 29387525. Robert F. Sumrall (1989). 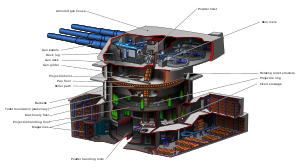 Iowa Class Battleships: Their Design, Weapons and Equipment. Naval Institute Press. ISBN 978-0870212987. Friedman, Norman (1978). Battleship Design and Development, 1905-1945. Mayflower; 1st edition (1978). ISBN 978-0831707002. Lawrence Burr (2010). US Fast Battleships 1938-91: The Iowa class. Osprey Publishing; First Edition edition (December 21, 2010). ISBN 978-1846035111. Speed Thrills I - Fastest Battleships?